Alive! Max Potency Multivitamins are the ultimate nutritional energy source containing the greatest diversity of daily essentials, whole food concentrates, phytonutrients and antioxidants to nourish, protect and invigorate your body. 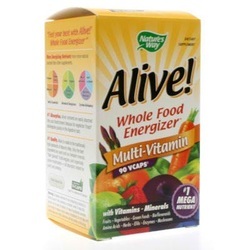 The original Whole Food Energizer , these multivitamins are made with daily essentials, botanical energizers and system defenders including: 25 vitamins and minerals, 18 amino acids, 12 digestive enzymes, 14 green foods, 12 organically grown mushrooms, 40+ antioxidants. As with all Alive! multivitamins they're also packed with high potency B-vitamins, 20+ fruits and vegetables and nutrients for whole body nourishment to help support bone health, daily energy, colon health, eye health, heart health, and immune defense.